Group Tours at Highland are uniquely tailored for parties of fifteen or more. Enhance your group tour experience by adding Highland Fare box lunches in an event space or an audience with a costumed James Monroe reenactor (subject to availability). Please email education@highland.org or call 434-293-8000 with questions and to inquire about availability. Evening tours for groups are available upon request. 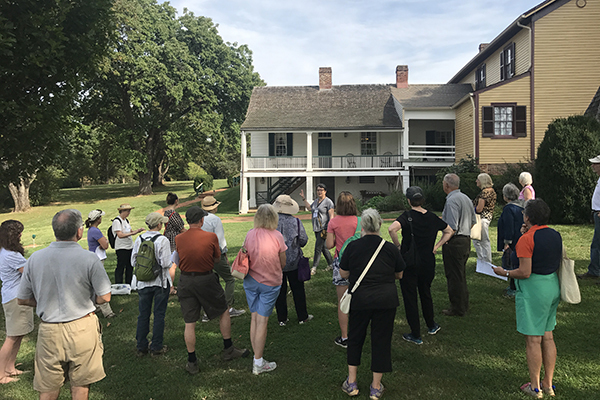 Adult groups will be met by one of our expert guides for a 40 minute tour which includes the site of the recently discovered 1799 Main House, the 1818 Presidential Guest House, plus exhibit spaces. Learn the significance of Highland and its occupants, as well as how recent archaeological discoveries have upturned the understanding of this plantation. Allow time for independent exploration of the grounds, original outbuildings, and the museum shop. Guided tour of interiors, exteriors and grounds where students are invited to think about friendships, family relationships, risk-taking, conflict, and slavery at Highland by posing essential questions that focus on the students’ own experiences and understanding of the world. Students are encouraged to empathize with the dilemmas of the founding era and to draw understanding that is applicable today. Historic games available upon request. Guided tour of interiors, exteriors and grounds where students will learn how the Monroes’ main house was lost and then rediscovered. Hands-on activities will evaluate primary and secondary sources, explore the pathways of archaeological research, and interpret real artifacts. Students will engage in historical thinking skills and consider how new information changes our understanding of the past. The augmented reality experience is currently not available for group tours.